I read this article and found it very interesting, thought it might be something for you. 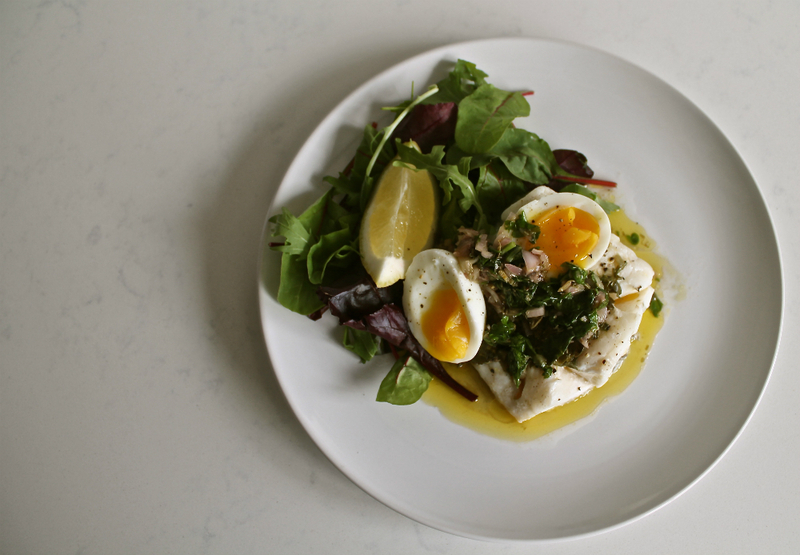 The article is called Recipe: Roast Cod with Soft Boiled Egg & Salsa Glas and is located at https://www.totallydublin.ie/food-drink/recipe-roast-cod-with-soft-boiled-egg-salsa-glas/. I love this recipe because it’s so versatile – serve it with toasted sourdough for brunch, with mash or colcannon potato cake for a hearty winter dinner or with a green salad for something more summery. The salsa glas is a salsa verde made with Irish grown herbs and you can either make it in a blender or chop it by hand depending on what consistency you prefer. I like it chunky so do it by hand. Finely chop the garlic, capers, herbs and anchovies and put them into a bowl. Add the vinegar and then stir the rapeseed oil in slowly until you achieve the desired consistency. Place the fish in a shallow roasting pan and put a generous tablespoon of the salsa on each piece. Serve with a soft-boiled egg (everyone has their preferred method!) and some uncooked salsa.